Colorado, like many western states, faces a sticky problem: its outdoor spaces are being loved to death. The problem is multi-fold, a product of the transient recreational eco-tourism industry, but also of its influx of permanent residents. Colorado’s population is projected to double from five million to ten million people from 2010 to 2050. The nature of recreation has changed for these newcomers to the state, threatening the traditional North American model of conservation that places the greatest burden of conservation funding on licensure for the hunting and fishing community. As hunters and fishers age, their knowledge of their sport ages with them. Once intergenerational traditions, interest in hunting and fishing has waned in recent years, leaving state institutions like Colorado Parks and Wildlife (CPW) in need of new funding sources to supplement the changing nature of recreation in the state. 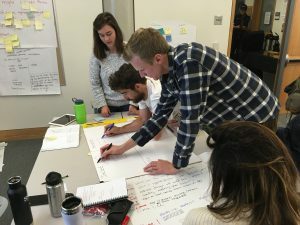 Last Friday, I got the chance to join a number of graduate students from around the Yale School of Management and the Yale School of Forestry for a rapid ideation session with GreenLight–an organization with the Yale Center for Business and the Environment–aimed at informing this problem. The challenge statement: How might Colorado Parks & Wildlife improve and strengthen funding while maintaining strong relationships with its stakeholders? It’s a complex problem–one faced by states across the west as interest in non-consumptive recreation has grown. Being from Colorado myself, growing up with parents that hunted pheasants and fished trout, I’ve seen how my own small town has changed, too. Once a sleepy desert midpoint between Grand Junction and the San Juan mountains, my hometown of Montrose has come to reflect those new non-consumptive priorities (including a new water sports park, an interconnected bike trail network, and a recreation center complete with a climbing wall modeled to look like the Black Canyon of the Gunnison). That’s why I was so excited to hear how Colorado has incorporated the SHIFT (Shaping How we Invest For Tomorrow) framework of thinking about outdoor recreation and conservation. One of SHIFT’s key principles, CPW’s “obligation to ensure long-term stable funding sources” framed our discussion. Statewide Partnerships Coordinator Dan Zimmer and Hunter Education Coordinator Travis Long helped us to guide our discussion and temper our idealism. 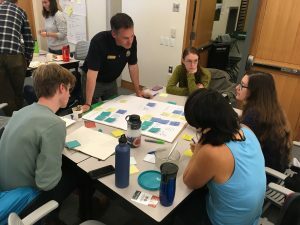 I’ve always been somewhat of a skeptic to the idea of flashy brainstorming sessions (if only for how poor my handwriting is), but my first experience with the GreenLight model transformed the way I think about the problem posed by CPW and my thoughts on the conservation vs. recreation debate more generally. We worked in four groups of four, sharpies in hand, to expand, reframe, ideate, and focus our understanding of the problem and our proposed solutions. Our conversations often hinged on individual words, their meanings and implications, and how the nature of the questions itself frames the answers they solicit. One participant mentioned, “it feels like we’re talking about basic sentence structure like in 8th grade.” We were. Language itself defines the bounds of our questions and our solutions. After two hours of pinning sticky notes, writing and rewriting questions, and quite a few sheets of poster paper, we transitioned from our individual group’s reframing of our question into our best ideas for solving the question we posed. Every one of the four groups approached their reframed question differently, and each question yielded a range of compelling, if sometimes weird, solutions. Solutions ranged from a Venmo contribution system on trailheads to gear partnerships to a “feces fee” system for charging the impact of human waste. Often, groups’ weirdest ideas had already been implemented in some way by CPW already. In our short pitch sessions, it was striking to see what was possible in four hours of guided ideation. 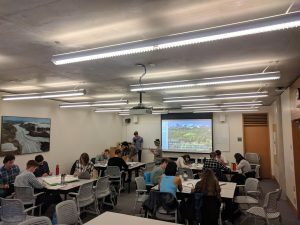 No one by any means proposed a silver bullet for a sustainable funding source for CPW, but each of our projects, from a gear rental library to an app for tracking consumptive recreational use, took on microcosmic aspects of a complex problem. As we were told, “it gets murky.” But if Colorado can take a lead on preempting the impending problem of declining hunters and fishers, other western states will soon have a model to follow. A huge thank you to Colorado Parks and Wildlife, the Yale Center for Business and the Environment, GreenLight, and the Ucross High Plains Stewardship Initiative for facilitating our session, and I know that I’m not alone in my excitement that our report to CPW will make an impact. Some sticky note somewhere in our classroom just might be the answer that Colorado has been waiting for. This entry was posted in News, People, Wildlife and tagged Colorado, Colorado Parks and Wildlife, conservation, fishing, Franklin Eccher, GreenLight, hunting, recreation, Yale Center for Business and the Environment. Bookmark the permalink.